A simple marinade and your favorite bbq sauce are all you need for these simple yet flavorful BBQ Chicken Kabobs. I am just itching for spring and summer to arrive here in Chicago, especially after we’ve had a couple of 60 degree + days. Seriously beautiful weather for early March! And it just might have been this weather that inspired me to make a recipe I typically only make during the warmer months of the year, BBQ Chicken Kabobs. Kabobs are so fun to make because they’re versatile. Throw any meats or veggies that you like on a stick, grill, and enjoy. One rule of thumb that I always use is to grill meats and veggies on separate skewers, mainly because meats and veggies have different cooking times. Veggies usually cook quicker, so you can remove them while your meats finish cooking so that nothing is over-cooked. My recipe for BBQ Chicken Kabobs is really pretty simple. I use a marinade that comes together quickly. Then, I allow the meat to soak in it for about 30 minutes before threading the pieces on a skewer and grilling them. If you don’t have some of the spices I use, just omit them. And if there’s a spice I didn’t use that you think would work well, feel free to throw it in. The other thing I like about kabobs is that they are quick cooking because the chunks of meat are fairly small. I do have a favorite homemade bbq sauce that I’ll share with you at some point. When I went to make these kabobs I realized I didn’t have one of the ingredients I needed for the sauce, so I resorted to our favorite store-bought brand (Famous Dave’s). Use any sauce that you like! I paired these BBQ Chicken Kabobs with these Garlic Herb Hasselback Potatoes. PS: If you are using bamboo skewers, be sure to soak them in water for at least 30 minutes before using them. In a large gallon sized ziplock back, combine all marinade ingredients together. Add chicken chunks to the bag, close it, and shake the bag so that the marinade coats the chicken. Allow the chicken to sit in the bag for 30 minutes, then thread each piece of chicken on a bamboo skewer.Discard leftover marinade. Heat your grill or a grill pan to medium high heat. 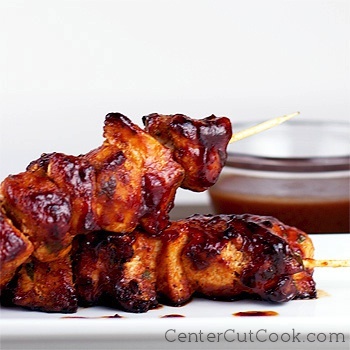 Place the skewers on the grill and cook for 12-15 minutes or until chicken juices run clear. Be sure to flip the skewers for even cooking. A few minutes before the chicken is done, turn the heat to low and brush all sides of the chicken with your favorite bbq sauce.